Includes spacious open-air living room and dining room with covered outdoor deck, restaurant-inspired gourmet kitchen and a private study/entertainment room. Constructed from hand-crafted tropical hardwoods, granite and quartz flagstone the main house is furnished with custom hand-carved teak furniture and décor imported from Bali. With a 180-degree view of the ocean and seating for up to 12 guests, you’ll savor every meal around a custom made exotic Mora wood natural edge table. 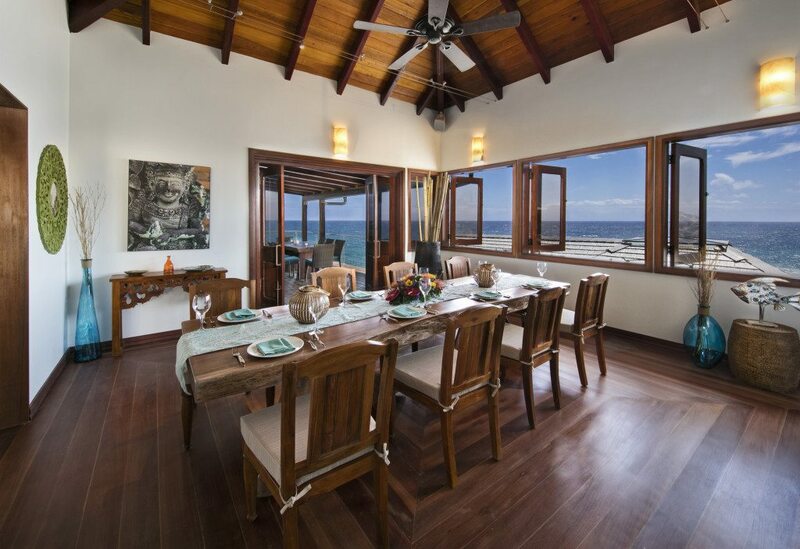 Enjoy the panoramic ocean view and tropical breezes with seating for up to 12 guests. 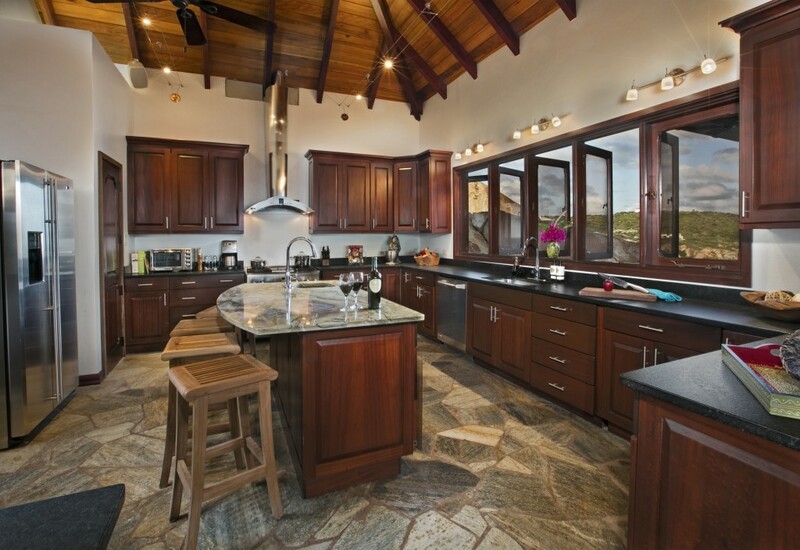 Every meal will be memorable when it is prepared in this professional kitchen with its inspiring ocean view. The kitchen features granite counter tops and professional grade stainless steel appliances, including refrigerator, range, oven, microwave drawer, dishwasher, dual temperature wine refrigerator, and a high capacity independent ice maker. This air conditioned room includes a 60″ smart television with surround sound, satellite entertainment system, Blu-ray, DVD, and stereo. Wi-Fi internet access and stereo sound system is available throughout the main house and pool areas. There are also two large day beds that can accommodate two additional occupants if needed. 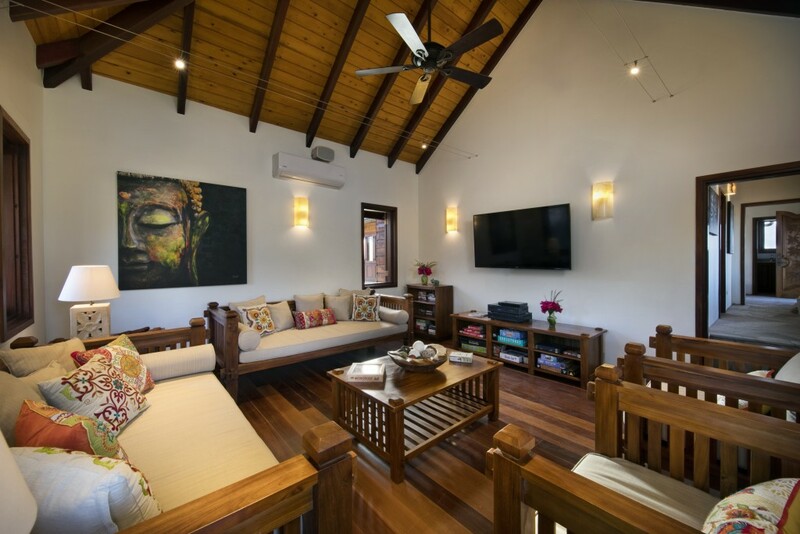 Designed with privacy in mind, each air conditioned suite is a separate villa built among the boulders and includes privacy window dressings, oceanviews from a private deck, secluded outdoor shower, ceiling fan, beverage refrigerator, coffee maker, telephone, WiFi and USB outlets. Built as the master suite Batu Permata, which means “Gem Stone” offers an expansive vanity with his and her sinks, oversized walk-in closet and covered panoramic outdoor bathroom and shower. The private deck directly overlooks the pool and ocean along with a separate set of French doors that open to a stone courtyard. Built entirely on top of the boulders Batu Besar, which means “Big Rock”, offers a built in day bed, ocean view desk and a uniquely designed outdoor shower that takes advantage of a natural split in the boulder. Also built entirely on top of the boulders Batu Besi, which means “Granite”, is affectionately known as the “Octopus Room” for the playful prints and carvings that decorate the space. It has a custom poster bed designed to be used as a full size king or split into separate twin beds and is perfect for young adults. The outdoor shower, which is suspended over the boulder, is covered and has a full ovean view. The most private of all the villa suites Batu Bulat, which means “Cobblestone” is perfectly nestled up against several boulders to create an expansive and secluded outdoor shower. This suite also includes a built in day bed. The spacious bathrooms include a natural quartz vanity top with his and her sinks, lighted makeup mirror, hair dryer, shampoo, conditioner and lotion with ample vanity storage. Each suite has a spectacular outdoor shower uniquely designed to take advantage of the natural landscape and topography of the site. 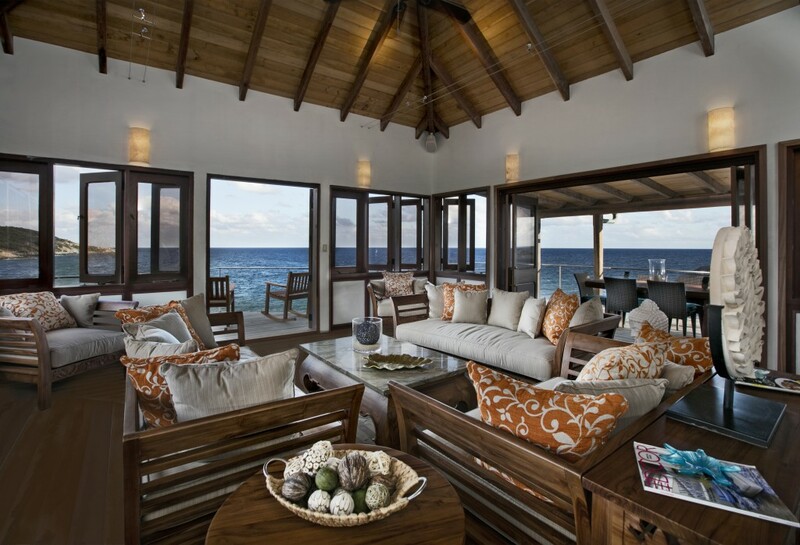 Each suite has a spacious outdoor deck overlooking the magnificent boulder covered shoreline. Relax poolside just feet from the ocean, allowing the Caribbean breezes to keep you cool while you enjoy the serenity of the waves. Designed to take advantage of the continual ocean breezes, the fresh water infinity pool is the perfect environment for sun bathing or relaxing in this idyllic Caribbean setting. The pool deck, which is made from quartz flagstone and bullet wood decking, is furnished with eight chaise loungers, four tables and two umbrellas. You’ll want to extend your stay when you see the “his and hers” storage and clothing hanging units, luxurious robes and personal security safe. The air conditioned facility includes a shock absorbing rubber floor, Inspire M4 Multi Gym, Schwinn elliptical exercise machine, Bowflex adjustable free weights, adjustable exercise utility bench, exercise ball, resistance bands and a smart TV. After a long day of travel a welcome basket with an assortment of goodies awaits your arrival. A wide variety of supplies can be purchased and waiting for you prior to your arrival such as Wine, Beer, Spirits, Meats, Seafood, Produce, Canned and Dry Goods. Customized culinary services are available throughout your stay to accommodate any of your needs. Please request services at least two weeks prior to arrival. Laundry of personal items will be done once during your stay. Please coordinate when you would like this service with the housekeeping staff. Daily maid service is provided Monday through Saturday. Please let us know if you have any special requests. A variety of spa services are available during your stay. Some services can be arranged and performed at the villa while others can be scheduled at a nearby facility. The entry doors, furniture, décor and rock landscape lighting are custom designed, hand crafted and imported from Bali by Roy Keegan of Arawak BVI. If you look closely at the wood and stone carvings throughout the property you will notice the Batu logo prominently represented throughout.